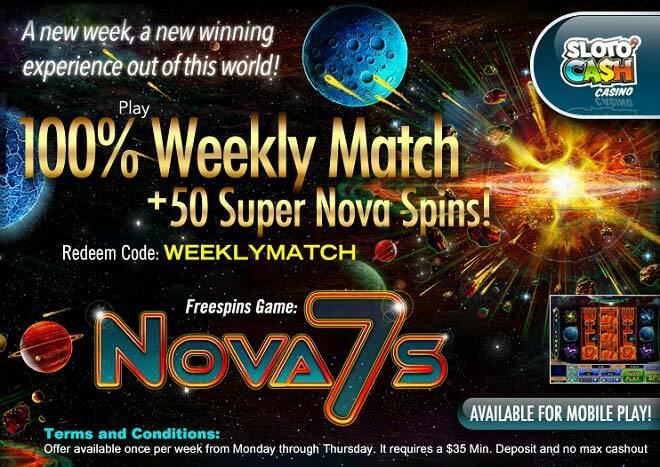 A supernova is an explosion of a massive supergiant star – and this October it’ll be exploding in your account and creating huge wins when you deposit $35 and up to play with a 100% Match and 50 Nova 7’s Spins! Land the red 7 wild on reels 2 and 4 and it will erupt with high intensity to expand over the reels and form a winning combo. Land it on reel 3 it will radiate and pay prizes with a 7x multiplier and up to 4 free spins could be triggered when 3, 4 or 5 blue 7 scatters make an appearance. Continue your solar flare of wins with the supernova 7 feature, the hypernova feature and more! Get ready for an explosion of wins this October with your deposits of as little of $35 to play with a 100% Bonus and 50 Nova 7’s Spins!